UCF students will resume normal classes and academic activities on Monday, Sept. 18. UCF is responding to feedback from students and parents concerned that between limited flights and heavy traffic, it would be difficult for students to return to campus this week. The decision was made to provide students enough time to manage any impacts Hurricane Irma had on their families and to return to campus safely. Faculty and staff members will report to work on Friday, Sept. 15 to prepare for normal university operations next week. Faculty and staff should contact their supervisor if they anticipate problems returning on Friday. On Monday, Sept. 11, UCF reopened its residence halls to on-campus students. Food service at 63 South and Knightro’s will resume today. To assist with recovery efforts, the university volunteered to serve as a staging area for the National Guard. Up to 1,000 troops are expected to stay at Spectrum Stadium, along with hundreds of recovery vehicles and equipment. On Monday, hundreds of National Guard members arrived on campus and set up base to immediately begin operations. UCF suspended all academic activity on Sept. 7 and closed for all non-essential activity on Sept. 8. The current closure includes the Rosen College of Hospitality Management, Health Sciences at Lake Nona campus and Center for Emerging Media in downtown Orlando, all of which follow main campus closure protocols. UCF regional locations will follow the decisions made by their respective host state college. UCF will remain closed through Wednesday, Sept. 13, due to Hurricane Irma. With the impacts the state has already seen, UCF wants to give students and faculty and staff members enough time to manage their needs before returning to campus. The university will also need time to conduct thorough damage assessments on campus. This decision — which affects all classes, including those conducted online – will allow time for students and faculty and staff members to return to Orlando safely. Students with specific questions about academic due dates should reach out to their faculty members. Again, the university encourages understanding and flexibility due to the extreme circumstances. The closure includes the Rosen College of Hospitality Management, Health Sciences at Lake Nona campus and Center for Emerging Media in downtown Orlando, all of which follow main campus closure protocols. UCF regional locations will follow the decisions made by their respective host state college. 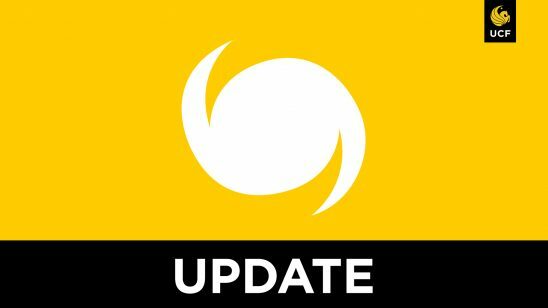 UCF will continue to monitor the hurricane and share more information as information is available. Regular updates about Hurricane Irma will be shared through email, on UCF’s website and through the university’s official social media accounts, primarily Facebook and Twitter. The University of Central Florida will remain closed through Tuesday, Sept. 12 due to Hurricane Irma. UCF made this decision to allow additional time to assess the impact Irma has on students, faculty and staff — and their families. The university urges Knights everywhere to stay safe before, during and after the hurricane. This closure includes the Rosen College of Hospitality Management, Health Sciences at Lake Nona campus and Center for Emerging Media in downtown Orlando, all of which follow main campus closure protocols. UCF regional locations will follow the decisions made by their respective host state college. Essential university employees may be required to work while the university is closed. Employees should discuss schedules with their supervisor. UCF will monitor the hurricane and share more information as information is available. Regular updates about Hurricane Irma will be shared through email, on UCF’s website and through the university’s official social media accounts, primarily Facebook and Twitter. The university previously suspended all classes and academic activity on Thursday, Sept. 7 and closed all non-essential operations on Friday, Sept. 8. The College of Central Florida will remain closed through Tuesday to allow students, faculty and staff time to recover from the impact of Hurricane Irma. Locations include Ocala Campus, Citrus Campus, Levy Campus, Hampton Center, Appleton Museum of Art, and Vintage Farm. Prepare immediately for this catastrophic storm. Please monitor www.CF.edu, Facebook and local media for updates. Due to Hurricane Irma the university will be closed on Friday, September 8th to all unauthorized vehicular traffic at 5 p.m.
All entrances will be closed and the only access onto campus will be from University Blvd. A police checkpoint will be stationed at this location and only students utilizing our ride out locations and authorized essential UCF employees will be allowed onto campus. All others will be turned away. There are no shelters on campus and the unauthorized parking of RV’s, trailers, watercraft or non-UCF permitted vehicles is prohibited and they will be towed from the campus at the owner’s expense. In addition, all garage parking for all UCF permitted vehicles will be closed at 8 p.m. this evening, Friday, September 8th. Please understand if you park in an on-campus parking garage the earliest you will be able to retrieve your vehicle will be on Tuesday, September 12. Thank you for your cooperation and patience and stay safe, Knights. Eastern Florida State College announced it will be closed through Wednesday, Sept. 13. This affects UCF regional locations in Cocoa and Palm Bay. See below for information about all campus closures at UCF regional locations. In preparation of Hurricane Irma, the University of Central Florida has offered its parking garages as triage and staging areas for first responders. Students who live on campus can keep their vehicles in parking garages and lots, as designated by their valid parking permits. Students from off-campus affiliated housing who will ride out the storm on campus also are permitted to have their vehicles on campus. Effective 1 p.m. Friday, Sept. 8, UCF Police Department personnel will close all entrances to the university except for the entrance at the intersection of University Boulevard and Alafaya Trail. Police will be staged at this entrance and will only allow students who are riding out the storm at UCF and authorized essential university employees on to campus. UCF does not serve as a public shelter. Unauthorized parking of non-UCF vehicles, trailers, RVs, and watercrafts is prohibited and may result in towing at the owner’s expense. All of the state colleges that host UCF’s regional campus partners have announced closure plans. UCF regional locations follow the decisions made by their respective host state college. Eastern Florida State College (UCF Cocoa and Palm Bay) announced that campus will be closed and all classes and programs will be cancelled Thursday through Sunday. Daytona State College (UCF Daytona Beach) will close at 2 p.m., Sept. 7, until further notice. Seminole State College (UCF Sanford-Lake Mary campus), Valencia College (UCF Valencia West and Valencia Osceola), Lake-Sumter State College (Clermont and Leesburg) and the College of Central Florida (Ocala) will be closed for all operations and classes from Friday, Sept. 8, through Monday, Sept. 11. A guide outlining resources available in Orange and Seminole counties and the City of Orlando is available here. A list of frequently asked questions is available here. This list will continue to be updated. In anticipation of Hurricane Irma’s impact, all academic programs and classes are cancelled starting Thursday, Sept. 7, to allow for sufficient preparations and travel needs. Faculty and staff should report as usual on Thursday to secure their offices, research and to take care of other issues. The campus will close on Friday, Sept. 8 and remain closed through the weekend and on Monday, Sept. 11. University facilities will be inaccessible, with the exception of Spectrum Stadium for Friday night’s football game. This decision — which affects all classes, including those conducted online – will allow time for students, faculty and staff to make safety preparations. Essential university employees may be required to work while the university is closed. Please discuss your schedule with your supervisor. UCF will monitor the hurricane and share more information about campus closures and openings as information is available. Regular updates about Hurricane Irma will be shared through email, on UCF’s website and through the university’s official social media accounts, primarily Facebook and Twitter. Now is the time to put your hurricane safety plan into action. Whether that plan entails evacuating or riding out the storm, Hurricane Irma — and your safety — must not be ignored. Although university housing remains open at this time, UCF urges students who live on campus to move to safe off-campus locations by noon on Friday, Sept. 8. Should Hurricane Irma threaten Central Florida, students who live on campus may not be able to stay in their on-campus locations and may be required to relocate to designated ride-out locations. Students with special needs should make plans now to relocate off campus. During a storm like Irma, the university cannot guarantee that power and water won’t be interrupted at ride-out locations. Additionally, food, water and medical assistance will be limited. UCF will share more information about ride-out options should it be required. As a reminder, the university does not serve as a public shelter during hurricanes. The Knights’ football game against the University of Memphis will be played at its previously announced new time of 6:30 p.m. Friday. Parking, and Spectrum Stadium, will open at 5 p.m. and no tailgating will be permitted on campus. With the unknowns surrounding Hurricane Irma, the best option for ensuring the game is played was to move it to Friday. UCF continues to closely watch Hurricane Irma, and we will announce any campus closures this afternoon. In an abundance of caution due to the potential impact of Hurricane Irma this weekend, UCF’s football game against the University of Memphis has been moved to 6:30 p.m. Friday at Spectrum Stadium. Parking lots and Spectrum Stadium will open for all fans at 5 p.m.
With the new game time, no tailgating will be permitted in any campus lot. First responders throughout Central Florida will be preparing for this Category 5 storm and UCF will not have the law enforcement resources needed to staff tailgating areas. Additionally, the university does not want to disrupt Friday afternoon classes with an unplanned campus closure for tailgating. UCF also needs time to secure Spectrum Stadium and the campus should Hurricane Irma threaten the area. Fans, including Family Weekend participants, who have single-game tickets for Memphis and cannot attend Friday night are invited to exchange their tickets to see the East Carolina home game on Oct. 14. Please call 407-823-1000 to exchange your tickets or for more information. UCF is closely monitoring the path of Hurricane Irma, which is currently a Category 5 storm heading toward the Caribbean. Should there be a potential for the Orlando area to be impacted, a decision could be made to close campus. That decision will be communicated via UCF Alert text, UCF social media and email messages. The Rosen College of Hospitality Management, Health Sciences at Lake Nona campus and Center for Emerging Media in downtown Orlando follow main campus closure protocols. UCF regional locations will follow the decisions made by their respective host state college. Updates about the status of the UCF-Memphis football game scheduled for Saturday evening and Family Weekend events will be shared later today. Finally, now is the time to prepare, not panic. Take precautions, such as developing a plan or building a hurricane safety kit, to evacuate or ride out the storm. A good hurricane safety kit should allow you to survive on your own for 72 hours and include basic survival essentials like water, food, communication tools and flashlights. Your safety remains UCF’s No. 1 priority. Our Department of Emergency Management will continue to track Hurricane Irma in partnership with the National Weather Service, and we will make decisions with your well-being in mind. I am a UCF mom living in Sarasota . I have an extra room l would offer to a student with no family nearby. Storm not projected to hit Miami till Sunday - closing dorms on Friday? My son feels as if he is being forced out of the dorm to a "safe" off campus location. Where is he supposed to go? What is "safe"? The campus is not safer than a motel somewhere? The campus police can't protect the dorm areas while the rest of the campus is deserted? The Motels - restaurants (safe places?) - those employees are expected to show up to work while UCF employees do not? UCF has canceled classes Thursday through Monday, and we strongly urge that students who live on campus move to safe off-campus locations by noon Friday, Sept. 8.